The Maryland men’s soccer team exploded in celebration on the Merideth Field turf as the final seconds ticked off the clock in the 2018 College Cup Final. 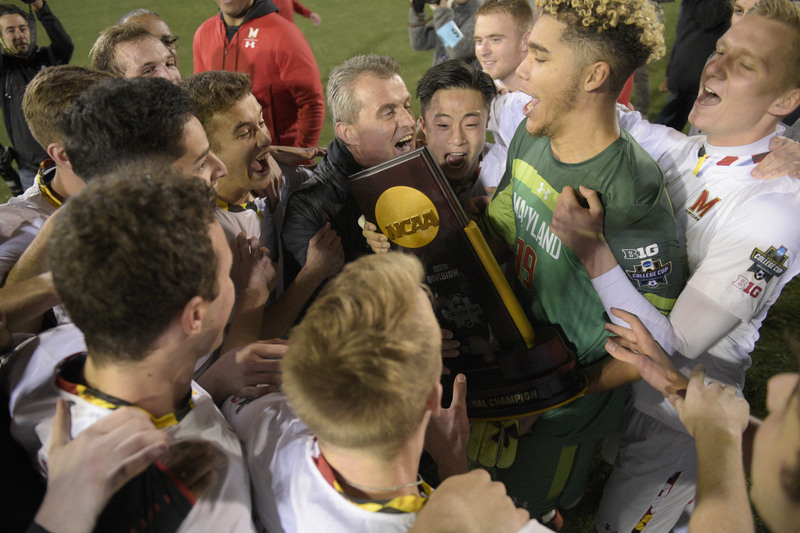 Amar Sejdic scored on a penalty kick in the 57th minute and Maryland held off Akron 1-0 on Sunday night to win its fourth NCAA men’s soccer title. Akron’s Colin Biros kicked Johaness Bergmann in the face pursuing the ball inside the 18-yard box resulting in a Maryland penalty shot in the 57th minute. Amar Sejdic calmly converted the opportunity with a with a well struck shot to the right of Akron goalkeeper Ben Lundt, who guessed wrong and dove to the left, giving Maryland the only goal of the match. “I though he would go to my left and he went to my right,” said Lundt of the penalty kick. The goal came on Maryland’s first penalty kick during regulation play all season. The Terrapins established a physical tone early as Chase Gasper was issued a yellow card for a sloppy tackle of Abdi Mohamed in the 11th minute. Maryland midfielder Amar Sejdic broke free in the box off a nice through ball by Sebastian Elney, but Akron’s Carlo Ritaccio makes a beautiful slide tackle that resulted in an Akron free kick in the 16th minute. Marcel Zajac repeatedly put pressure on the Maryland defense as he took on a defender and unleashed a left-footed shot from deep in the box that required a Dayne St. Clair save in the 18th minute. Maryland D. J. Reeves made his presence felt off the bench late in the second half. Reeves created space in the box with a nice cut back move and sent a right-footed shot towards goal that was saved by Lundt in the 41st minute. The rebound trickled towards Maryland forward Eric Matzelevich, but Akron defender Marco Milanese cleared the ball at the final moment. In the 76th minute the Terrapins earned another penalty when Elney flicked the ball forward to a streaking Matt Dirosa, who was undercut by Lundt resulting in a yellow card. Once again Sejdic took the penalty kick, but Lundt, made a beautiful read and dove to his right to smother the shot. Maryland shared the 1968 title with Michigan State and also won championships in 2005 and 2008. Coach Sasho Cirovski won his third title at the school. Maryland finished the season 13-6-4, and Akron was 15-7-2.